Members are invited to join us for a complimentary lunch, brief Credit Union reports, Board of Directors elections, and prizes. Member check-in begins at 11:30 a.m.* Three positions on the UL Federal Credit Union Board of Directors are to be filled. All branches of UL Federal Credit Union will be closed 10:30 a.m. – 1:30 p.m. for the Annual Meeting. Reserved parking available in Olivier Tower, 2nd Level (above Campus Branch). Board of Directors Nominations Letter 2019 (PDF – new window/tab). Board of Directors Nomination Letter – Biographical Information on Candidates 2019 (PDF – new window/tab). *Must be a member in good standing to attend. Lunch available while supplies last. Need cash? Borrow up to $5,000 at a reduced rate! Get cash for a vacation, home renovations, special purchases, consolidating bills, or any other needs. Begin your application online, visit a branch, or call 337-482-6956. Offer available now through April 28th. Rates as low as 7.95% APR* for 24 months. See a loan officer to apply. *APR = Annual Percentage Rate. Your qualifying rate is based on your credit profile, associated credit score, and our internal credit criteria. At 7.95% APR, pay 24 monthly payments of $45.20 per $1,000 borrowed. Your APR may differ based on your loan amount, repayment method, and other factors. Offer available through April 30, 2019. There is a Loan Processing Fee of $20.00 for all loan application requests. Federally insured by the NCUA. Shape up your credit card debt. Transfer your high rate balance now. The burden of credit card debt can be heavy and weigh you down! It’s time to get to work and shape up your debt with a University of Louisiana Federal Credit Union Platinum Rewards Mastercard®! Apply with a Loan Officer now! Call us at (337) 482 – 6956, or visit a branch. *6% balance transfer APR for the balances that are transferred from another financial institution’s credit card until that balance is paid off. For any purchases and/or cash advances processed after the promotional period, your APR will be 9.95%, 10.95%, 12.95%, 15.95% or 17.95%, based on your creditworthiness. Balance transfer promotion ends April 30, 2019. Please allow up to 10 business days for payment to be sent to pay off other financial institution’s credit card balance. Transfers will appear as a cash advance. Payoff amounts vary and ULFCU is not responsible for balance discrepancies from the amount that you report to the credit union to be transferred. See a loan officer for complete details. You Could Win Your First Payment On Us! 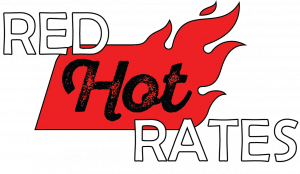 Red Hot Rates. Challenge us to beat your auto loan rate in May. Shopping for a new or used vehicle? Want to refinance your vehicle loan from another lender? Pay less for your auto loan at UL Federal Credit Union. Enjoy special rates in May, as low as 2.25% APR¹. Apply with a loan officer today! Contact us to learn more. ¹APR = Annual Percentage Rate. Your qualifying rate is based on your credit profile, associated credit score, and our internal credit criteria. At 2.25% APR, pay 36 monthly payments of $28.76 per $1,000 borrowed. Your APR may differ based on your loan amount, repayment method, and other factors. There is a Loan Processing Fee of $20.00 for all loan application requests. Member eligibility required. Offer available May 1-31, 2019. Equal Opportunity Lender. Federally insured by the NCUA. ²NO PURCHASE NECESSARY: Void where prohibited by law. Promotion open to individuals legally residing in the 50 United States who are 18 years or older. Winner must be in good standing at University of Louisiana Federal Credit Union “Credit Union”. Need not to be present to win and will be notified by phone, email and/or mail. Maximum prize value is $500.00 and will be applied to the member’s Qualifying Loan. Should the qualifying loan payment exceed $500.00, it is the responsibility of the member to pay the balance of the payment owed by the payment due date. If member’s Qualifying Loan balance is less than $500 then prize amount will equal the total dollar amount transferred during the promotion period up to the maximum of $500. Odds of winning depend upon the number of Qualifying Loans applied for and funded. Members with Qualifying Loans will automatically be entered to win their first payment paid by Credit Union. Qualifying Loans must be applied for and funded between 05/01/2019 and 11:59 p.m. Central Time on 05/31/2019 and include the following activities: 1) Finance a new or used vehicle loan with Credit Union and/or 2) Refinance a vehicle loan from outside of the Credit Union to the Credit Union between 05/01/2019 and 05/31/2019. A random drawing will be conducted from among all eligible entries received by sponsor and will take place on or before 06/28/2019. If a winner cannot be contacted within five (5) business days of the drawing date, the prize will also be forfeited and an alternate winner selected. Any bonuses or monies received in association with this promotion are subject to IRS reporting requirements. Recipients are responsible for income tax liability, if applicable. University of Louisiana Federal Credit Union employees, their immediate family members and household members are not eligible for promotion. Congratulations to ULFCU member, Elizabeth B, on winning the Annual Lucky Lagniappe Prize of $5,000! 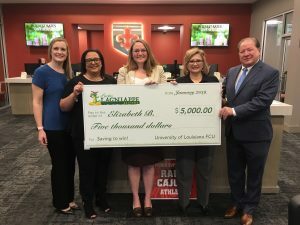 Elizabeth is the first $5,000 winner selected since the program launched in Louisiana in Spring 2018. We are happy to have her represent ULFCU. Elizabeth said she wanted to focus more on contributing to her savings and after learning about the Lucky Lagniappe Account incentives, she was excited to open her account. Pictured (left to right): Angela Melle, Director of Member Engagement Louisiana Credit Union League; Monica Declouet, Executive Vice President UL Federal Credit Union; Elizabeth B, Prize Winner; Debbie Kidder, CEO UL Federal Credit Union; Robert Gallman, President & CEO Louisiana Credit Union League. Lucky Lagniappe is a state wide initiative launched by The Louisiana Credit Union League to encourage more people to contribute to their emergency savings fund. This allows account holders to be rewarded with cash for making monthly contributions to their savings accounts. Since the program launched, there are 13 participating credit unions, with over 700 open accounts. It pays to save! Open your Lucky Lagniappe Account today. learn more about the Prize Schedule on the Lucky Lagniappe Account page – click here. Click here to read the article by the Advocate. Click here to view news coverage from Fox 15.